Over the years, I have met many intermarried people. When they marry, it is common for the partners to proclaim how much their in-laws love and accept them. But sometimes even from the beginning, the reports are not so sunny. And often, later in the relationship, tensions not apparent in the beginning become impossible to ignore. 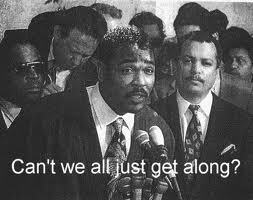 In the words of Rodney King, “Can’t we all just get along?” Yes we can. And we can do better than just get along. We can explore and experience synergy together. At Interfaithfulness, we help people explore the synergy between Judaism and Christianity, and partnership between Christians and Jew. Sometimes we call this synerjoy! People often misunderstand what this is because they think they already know what it means, but they don’t! In order to understand this kind of synergy is, let’s look for a moment at what it replaces. Interfaithfulness synergy replaces the polarization that used to be the norm, and for many, still is. Members of both communities have long been accustomed to defining themselves as being NOT the other. “I’m a Christian, not a Jew,” “We Jews believe the Messiah has not come yet, and Christians believe he has already come;” “We Jews say there is only one God, and Christians believe in three gods.” This habit of seeing one another as categorically “other,” as a standard for comparison, and even as a source of contamination if one gets too close, has to go. With synergy it does. Interfaithfulness synergy replaces suspicion, a state of mind and gut that has long characterized Jewish-Christian relationships. Interfaithfulness synergy replaces mere civility—kafe klatch interfaith relationships majoring in safe, inoffensive, and ultimately inane small talk, without ever discussing core issues. Interfaithfulness synergy replaces exclusivism on one or both sides. Exclusivists view their own community, tradition, and encounter with God to be the only truth, with all other communal traditions and claims false. Interfaithfulness synergy replaces patronization, treats other persons or communities in a condescending manner, as if oneself has a higher brand of truth or a prior claim to the truth which leaves others perennially and irretrievably one down. I found this somewhat formal definition of synergy here on the Internet. In general, synergy (. . . from Greek sunergia, meaning “cooperation,” and also sunergos , meaning “working together”) is the combined working together of two or more parts of a system so that the combined effect is greater than the sum of the efforts of the parts” [Margaret Rouse, article, http://whatis.techtarget.com/definition/synergy]. In other words, synergy means working together and getting more done than we could have apart, and even more than we could have accomplished if we worked separately and added our results together! And this “something more” includes more satisfaction and joy! At interfaithfulness, we believe that Christians and Jews are meant to work together synergistically for the furtherance of God’s purposes in the world. It is not just something “nice to do once in a while.” It is part of God’s will for all of us all the time. In weeks and years to come, God willing, our writing and doing at Interfaithfulness will explain more deeply what this synergy is and what it can look like. Let’s suppose you are one of those people, or perhaps a couple, who are experiencing tensions between Christians and Jews. That happens, we know, even with very nice and well-meaning people and their families. Can you see how expanding the common ground between the warring parties can make today’s no-man’s-land into tomorrow’s field of cooperative satisfaction? Some people may want to steer away from all of this, stating as their reason a fifty dollar word, “syncretism.” This is hard to define, but it is a hot button issue. Used negatively, it is often taken to mean one religion absorbing and redefining another. Yes, that is rather distasteful. At Interfaithfulness we don’t believe in absorbing and redefining someone else’s religion because we recognize that all of us “see through a glass darkly,” that we all “know in part and prophesy in part,” as Paul the Apostle wrote. That means none of us has a corner on the truth, and some of the things we think we know we don’t know at all! If we all only know a part of the truth, it doesn’t make sense to stamp our vetoes and improvements onto another community’s artifacts and insights due to convictions about the superiority of our own. We have a lot to learn, much to learn from each other, and much to learn together. We even need to earn to listen. Then they that feared the Lord spoke one with another; and the Lord hearkened, and heard, and a book of remembrance was written before Him, for them that feared the Lord, and that thought upon His name. God likes to jot down the names of people who know how to speak to each other and listen to each other, out of a common reverence for God, serving him together, living in this kind of synergy. A good question. Good, just like synergy. So are you ready to live and work better together across the no-man’s-land that has historically existed between Christians and Jews? Are you ready to go beyond distrust, animosity, patronization, and small talk that you might experience synergy? Or do you have another option you like better? Drop us a line at info@interfaithfulness.org or give us a call and let’s talk about it. Our number is 626-765-4359. Shalom from Interfaithfulness, where we are touching tomorrow.